A campaign of silence by corporate media with their meat ad profiteering and by federal agencies which historically protect the meat industry have criminally neglected informing the public of Mad Deer, Mad Cow, Mad Caribou, Mad Elk etc. In 2018 at least 25 U.S. states, 2 Canadian provinces and Norway have reported cases of Mad Deer, Mad Elk, Mad Moose, Mad Bear, Mad Caribou, Mad Mule Deer, Mad Reindeer. Arkansas, Colorado, Illinois, Iowa, Kansas, Maryland, Michigan, Minnesota, Mississippi, Missouri, Montana, North Dakota, New Mexico, New York, North Dakota, Ohio, Pennsylvania, South Dakota, Tennessee, Texas, Utah, Virginia, West Virginia, Wisconsin, and Wyoming are some of the states reporting incidents. 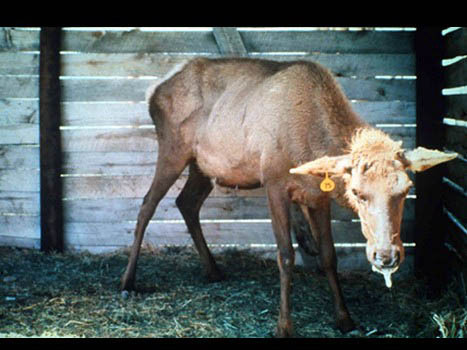 hunter tourism industries and have criminally neglected the public health attempting to hide the disease with the term Chronic Wasting Disease rather than spongiform encephalopathy, a disease of many species. The Japanese government tests all American meat, because of the USDA's refusal to test. Ann Veneman, former USDA Secretary, mentored by the American Meat Institute's Richard Lyng, began the history of USDA censorship before becoming a head of UNICEF. in which they inhale a blood mist. twice against the cattlemen. The decision stated that the truth is not libel.